Former Egyptian President’s suffers a stroke and declared clinically dead after being moved to a military hospital. Former Egyptian President Hosni Mubarak’s health took a turn for the worst on Tuesday, and state-run media reported that he has been declared clinically dead following his transfer to the Maadi Military Hospital. The Egyptian state news agency MENA reported that Mubarak was taken to the intensive care unit upon his arrival to get treatment for a stroke he had suffered earlier Tuesday. The report said the doctors in the Tora prison, where Mubarak had been held, had failed to treat the stroke. Earlier, The Associated Press reported that Mubarak was likely to be moved out of his prison hospital to the military facility. The report cited state TV which said Mubarak was in a “critical” condition and has been placed on a respirator. MENA reported that Mubarak’s heart stopped and a defibrillator was used to restart it. A prison official speaking to AP said doctors reported that the 84-year-old former president has fallen unconscious. He added the prison authorities are considering moving him to the military hospital nearby in Maadi, a suburb near Tora prison where he is held. MENA also reported Mubarak will likely be moved in the next hours if his health deteriorates. Mubarak's was sentenced to life in prison on June 2 for failing to prevent the killings of protesters in the uprising that ousted him last year. 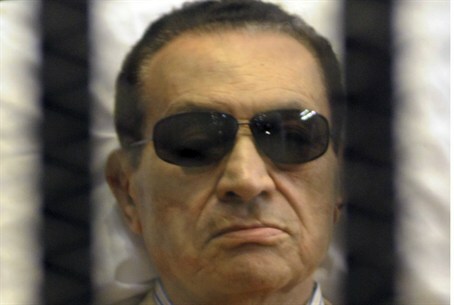 Since his arrival at the Tora prison, Mubarak’s condition deteriorated. He has been suffering from high blood pressure and breathing difficulties and is diagnosed with deep depression. Last week doctors used a defibrillator on him twice after they could not find a pulse. Mubarak’s lawyer said last week that his client does not trust his doctors in the prison hospital and fears they are out to kill him.